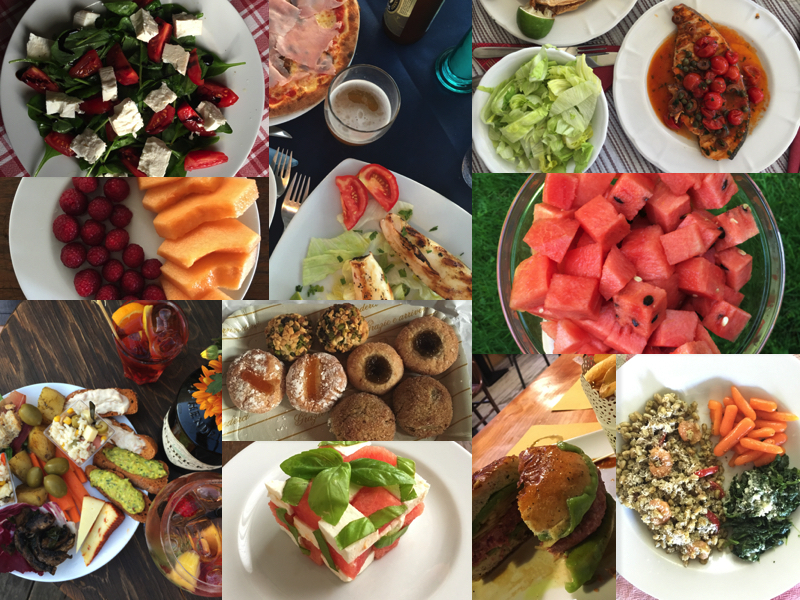 Welcome to a new Food Diary! As in the last few months, today I'm going to share a mix of healthy and naughty foods I ate. This time I also offered some mini reviews to some of the dishes, in order to help you get a better idea about those dishes. Hope you enjoy it! Burger with green tea bread, wasabi provolone cheese, pork&beef meat patty, daikon and ginger. This was quite an interesting combination, which was bursting with flavour, though I didn't feel the green tea in the bread. Watermelon, Feta and basil salad. I saw this on Pinterest and it seemed interesting, so I decided to give it a go. On Pinterest it was made with mint, but I preferred to use basil. It should be refreshing and super easy to make, just takes some patience. To be honest I wasn't as impressed with it. It was ok, but I won't prepare it again. Farro Quattro Formaggi al forno. This was delicious! For those who don't know, my favourite dish is truffle Quattro Formaggi, if possible with sepia ink pasta. Farro pasta with zucchini, shrimp and a dusting of parmesan. Though very simple and healthy, this was very tasty. Spinach salad with tomatoes and feta cheese. Grilled calamari with tomatoes salad and pizza. Sicilian almond cookies. These are to die for! If you plan on visiting Sicily, you need to be ready to get addicted and a bit fatter, cause you will eat these daily if you can. At least I did and don't regret anything! Swordfish a la Favignana and fried fish platter. More Sicilian cookies and pastries. Smoked fish selection and pesto pasta with shrimp. My smoked fish platter was a bit disappointing, as it was a bit dry and not as buttery as it should have been. Pesto farro salad with shrimp, tomatoes and a dusting of parmesan with a side of carrots and spinach. The farro salad was surprisingly delicious! Lots of yumminess! I absolutely love watermelon. That Feta and watermelon salad looked amazing! Ohh jetzt hab ich wieder Hunger! What an amazing post! I am literally drooling over these photos! Wow, great post! Everything looks so delicious! I want a heart salat now! *_* Looks so tasty! I need all of that fruit now! Oooh the watermelon feta and basil salad looks so good, I definitely want to try that! So nice to see an honest account of what you eat, you seem to eat really healthily but balanced! That seafood platter looked amazing! Watermelon, feta and basil salad sounds utterly delicious! I love how varied your menus of late have been - I find myself eating an incredible amount of sweet food here in the South of France right now haha, there's too many dessert options!! OMG!!! everything look so tasty! Love this amazing post with such breathtaking pictures, thanks for sharing!!! Amazing food photos. I want the burger now. Ah I want a watermelon! Still haven't tried this year! The watermelon, feta, basil salad looks so delicious and interesting. Love all types of fruits for the summer! This just made me so hungry, I wouldnt be able to choose out of all! This ALL looks amazing but that burger is really what jumped out at me. It sounds so unique and delicious! So many goodies. Ughhh now my tummy is rumbling. Yummy this all looks so good! Amazing photos, these look really delicious! My favourite is the frozen yoghurt with berries! I would love to have some right now :) Oh, and watermelon too! OMG <3 these look appetizing. have you ever tried Indonesian food? I'm veru hungry!! I love the moment of "apertivo"! I love those photos! Yummy! Watermelon and Feta are my fav dish in the morning. These all look so yummy! WOw! Now i'm hungry...lool! This is the first blog post ever that has made me so hungry! Lovely blog post and thanks for sharing. This is all so healthy!! YUMMY! Love me some watermelon :) You're making me hungry!